The most important thing you might want to consider is the fact that HD2 seems to be the very first smartphone with good enough specs to run Windows Mobile 7. For now, it relies on Windows Mobile 6.5, but it’s bound to get the upgrade, once the new OS surfaces, or so we hope. On board, you’ll find a capacitive touchscreen display with a 4.3 inch diagonal, multitouch support, a 480 x 800 pixel resolution, 512 MB ROM, 448 MB RAM and a microSD card slot (SD 2.0 compatible). 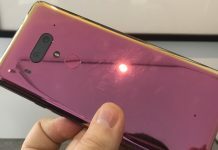 The device weighs about 157 grams, it uses a Qualcomm Snapdragon 1 GHz CPU and, as far as connectivity goes, it provides support for 3G, EDGE, GPS, WCDMA, WiFi and Bluetooth. At the back of the smartphone there’s a 5 megapixel camera with autofocus and dual LED flash and this beauty also sports FM radio, GPS and a proximity sensor.